Gyroscopes are used in countless devices. From smartphones, tablets, and video game controllers to airplanes and space telescopes, gyroscopes perform tasks ranging from the everyday to the extraordinary. 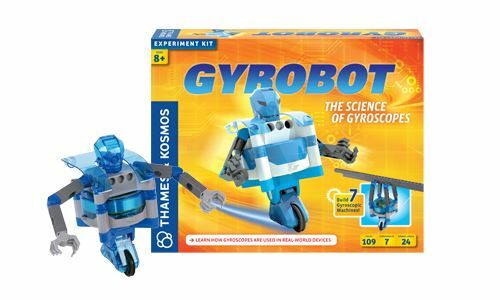 With this kit, children can explore the astonishing powers of the gyroscope by building seven motorized models, including a robot that can balance on two linear wheels and move along a tightrope! Kids will learn about the physical science principles that keep the robot balanced, making it appear to defy gravity. By constructing seven different models with the motorized gyroscope unit, young engineers can experiment with and learn about the science of gyroscopic devices and the indispensable role they play in our lives. The models include the gyroscopic robot, a balancing personal vehicle, a gyro horizon (or artificial horizon), a gyrocompass, a balancing game, a tightrope walker, and a flight simulator. At the core of these models is a unique motor-driven gyroscope. A gyroscope is a rapidly spinning wheel mounted in such a way that its axle can move in any direction. Because of the laws of physics, the gyroscope reacts to external forces differently than a non-spinning wheel would: it resists forces in certain directions. This behaviour allows it to be used for all sorts of applications related to balance, rotation, and orientation. Fun, hands-on experiments with the motorized gyroscope unit make these physical laws tangible and easier to comprehend. The word “gyroscope” comes from the Greek words gyro, for “circle” or “rotation,” and skopeein, meaning “to see.” The name was originally coined by a scientist who built the device in an experiment to see Earth’s rotation. Although gyroscopes are used in very sophisticated devices, essentially they are simple mechanical instruments. A child’s spinning toy top is a simple example of a gyroscope. A full-colour, 24-page, illustrated experiment manual provides step-by-step assembly instructions and scientific explanations. Ages 8 and up. 102 pieces.